First I learned to work with Inkscape, a free 2D vector drawing program for laser cutting. I discovered that it is a good tool for illustration (e.g for web design) too. Next I needed a 3D design tool to create parts with a 3D printer. I looked at different programs such as Sketchup, 123D Design but I increasing dislike the proprietary character of these programs. Echoing the words of Richard Stallmann "the proprietary program is a system of unjust power". On the non-proprietary side there is FreeCAD and Blender but I found the learning curve of these programs too steep. 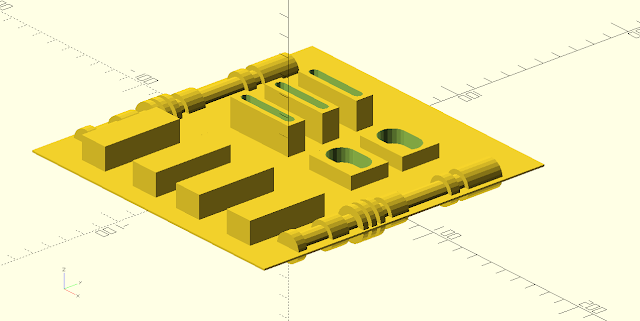 Then I discovered OpenSCAD when reading an article on HackaDay. It's a free (as in free beer and free speech) program running on Windows, Linux and OSX that has a great community. Instead of using a GUI the user has to scripts his models with a simple descriptive programming language. This seems strange and cumbersome at first but it actually works for me. I found it very easy to get into. OpenSCAD is very lightweight. A GUI in CAD programs tends to be a burden on a PC and OpenSCAD lacks that GUI. Because of the script that OpenSCAD uses it is very apparent what is in the 3D model and what the dimensions are. Lastly the script is saved with the model. The comparison with HTML comes to mind. Therefore it is possible for anyone else to see how a model is made, learn from it and make changes to it. For now OpenSCAD works for me although I'm not sure what will happen if I'll try to design more complex 3D models. The Darth Vader chest box has a very distinctive look with lots of distinctive buttons and other parts (see images below). I modeled these parts with OpenSCAD beginning with the simple buttons working my way up via the coin slots to the complex rods. I'm satisfied with the result thus far. Next I'll 3D print the parts and glue them to the plywood chest box I made earlier.